New exhaust for my 125. 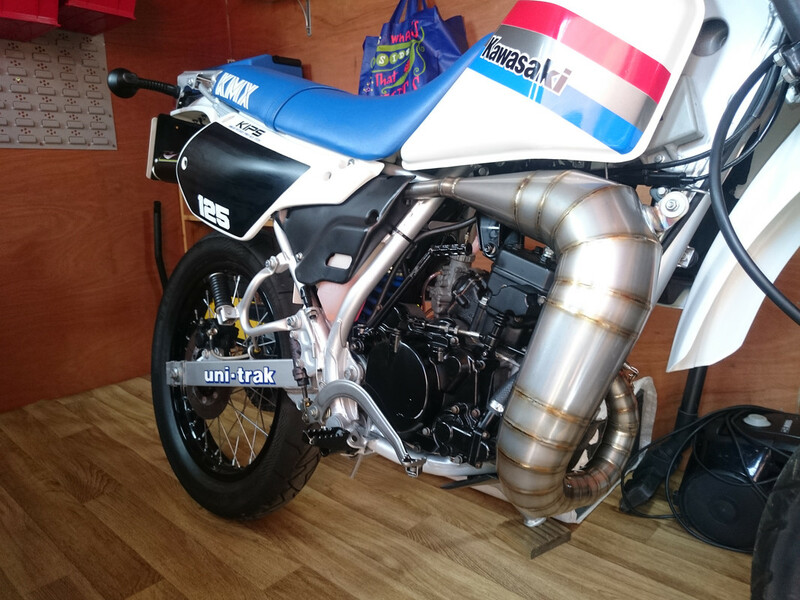 Posted: 21:09 - 25 Jun 2018 Post subject: New exhaust for my 125. Not sure if I should start topic here or in show&tell? Finally got my new custom exhaust system built for my Kawasaki 125, and I'm very happy with it too! I'll update this thread once I've got a couple of missing parts orders received for the remaining parts I need to make this bike work and eventually look respectable hopefully. The aim is a running bike with all the bits I've collected over the last couple of years, and once the cosmetic issues of rust and rusty fasteners are sorted or at least improved, I'd like to try and make it look somewhere near as smart as Knackers DT125R. A lot of work left before it gets to that level and I fear alot more expensive too. Cheers, I was cursing last night why can't I make it work like photobucket with an easy paste link. I'm off to get my zimmer frame with Team Green stickers all over it, so I can get out to the shed and start tinkering, if I can find me glasses that is?